I have to say that I absolutely love my card! The colours in this amazing paper line are so bright and cheery they just make me happy! The paper line is by Imaginisce's Lucy Bird line and are called Daisy May & Pretty Maids all in a Row. The cardstock I used was Bazill, of course! I coloured her with Copics (E00, E02, E11, E13, E41, E43, E44, E55, E57, E59, BG11, BG13, YG11, YG13, YG17, RV32, RV34, R02, YR21, YR23 and YR24). Other supplies used: Dew Drops, Kraftin Kimmies Sentiment. Welcome to Paper Sundaes Challenge #6 which is being sponsored by Paper Jewels. 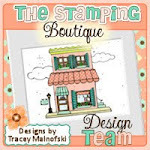 Paper Jewels is a great new Canadian Store that sells the Bildmalarna stamps and will soon be stocking Sweet Pea stamps. If you haven't seen these yet but sure to check them out on Jenny's website! This week the challenge was a technique and in this case it was Distressing which always seems to be a challenge for me. About a year ago I bought the Making Memories Distressing Kit and sad to say I've only really used it twice. I'm not sure why I haven't used it more since distressing is really quite fun! 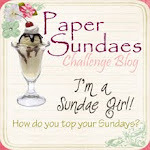 Be sure to check out the Paper Sundaes Challenge Blog and play along. 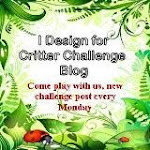 A new challenge is posted every Sunday! The prize for this weeks challenge is 3 Bildmalarna stamps! Happy Sundae! 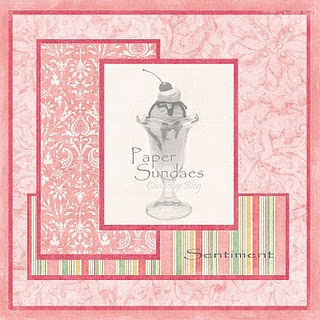 It's time for Paper Sundaes Challenge #5 and this week the theme is "A Glittery Spring". 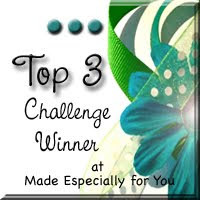 Paper Jewels is hosting their first ever challenge! Challenges are posted the first Sunday of every month so be sure to play along! The winner of this challenge will win the image I also used on my card "Mimosa with Flower Basket". It is so adorable! For my card I used K&Co Design Paper and Bazill cardstock as the base. Mimosa was coloured with copics (G82, G85, E02, E11, R02, E13, E17, E18, E19, E41, E43, #44, RV32, RV34, RV13 and RV14. Other Supplies used: Pebbles Chalk, Blossom Spica Glitter Pen, Prima Flowers, Hero Arts Pearls, Stampin Up Border Punch. 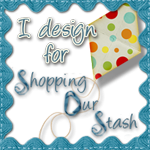 Be sure to check out Jenny's website and see the other Bildmalarna stamps that Jenny sells. They are adorable, the prices are great and the shipping costs are so low! Yay....Happy Sundae! The Challenge for this weeks Paper Sundaes Challenge was a sketch challenge. Below is may take on it. The image that I used was from Paperworks Co's Little Loud Stamps Freckle Love Collection and is called "Charlotte's Valentine". I coloured her with copics (C3, C5, C9, E00, E02, E11, E13, E15, R02, RV10, RV13, RV14, and RV17). Once she was coloured I used pink shimmerz and painted it on the light pink hearts, her hair band and parts of her dress. I also used some puffy heart stickers by Recollections, one on her hairband and some below the sentiment. The design paper that I used was from Little Yellow Bicycle and is part of the Sweet Love collection, isn't it so cute? I inked the edges with Brilliance Starlite Ink and used Martha Stewart border punches. A big THANK YOU to Peggy at Paperworks Co for sponsoring us again this week! Be sure to check out the newest line of stamps by Paperworks Co. that was just released on Feb 5th and join us over at Paper Sundaes and play along! The price for this week's winner will be animal and sentiment stamp set from PWCO and a couple of copic markers! It's an amazing prize so be sure to head over and play! Don't forget to check out the other amazing cards made by the rest of the design team!